CDR’s BRT Impact Report—One Step Closer to Inclusive Urbanism? 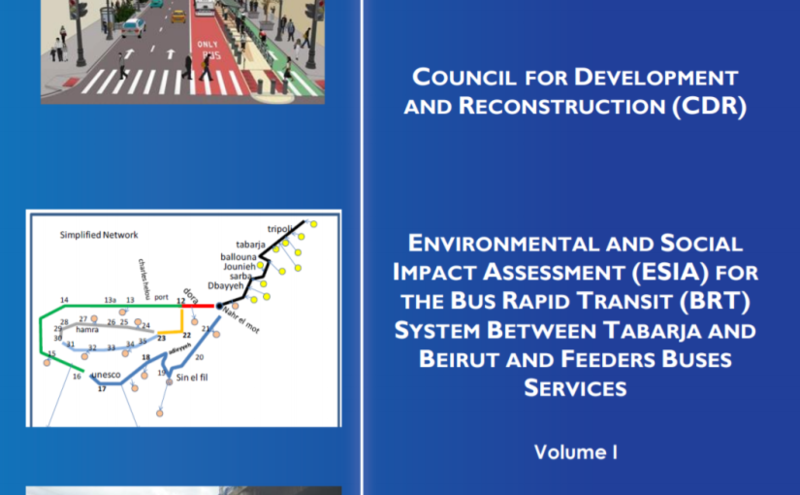 The CDR’s BRT impact report is finally out! Prepared by ELARD with input from EGIS, the document is quite a beast, clocking in at almost 400 pages. But it’s very readable, and it includes plenty of background for people who need to catch up on the basics of this proposed project. Many of you will be interested in the technical details, but in this post, we will focus on the socioeconomic dimension. If you have any thoughts about this or other aspects of the report, please do share them on our #BusCommunity discussion board. We’ve been following ELARD’s track in this study over the past year, publishing several blog posts about the various focus groups and public consultation sessions they organized. And as much as we’ve enjoyed documenting this process, we’re also quite pleased to see our modest involvement documented in the report itself! It’s a little bit surreal to see our work acknowledged in an official CDR study. On pages 244, 247 and 253, the report quotes some of our questions and feedback during the first public meetings. On page 249, ELARD focuses more directly on our coverage: “One of the special interest groups who attended the meeting are active in the public transport domain and have a website, an online blog, and two pages on social media (Facebook).” Showing screenshots of Facebook posts we’d made, the report links to our blog as well (“a good summary of the meeting proceedings”, “the second blog article focused on the BRT system and integration”). In their words, Bus Map Project “portrayed a general positive outlook on the merits of the BRT System and most importantly on the process of engagement of the public in the early stages of the study.” Sounds about right! But what’s much more important than this tip of the hat is seeing our major concerns fleshed out in the impact assessment findings. In Section 7.11 on page 299 (“Impacts on Socio-Economic Aspects”), ELARD provides a table showing “the potential impacts and their respective consequence assessments” of the proposed BRT project. There’s a lot of different categories in this section, but given our focus on the existing transit system, we’ll highlight the measures we find most relevant to that topic. While we’d take issue with characterizing the system as “random” (a characterization that is in itself based on a problematic distinction between SE.O.1. and SE.D.1; see below), we greatly appreciate the gravity with which the problem of operator livelihood is addressed and emphasized in several places in the report. Furthermore, the report describes mitigation measures already taken to address this problem (SE.O.1. ): “The project has considered options and incentives to encourage local operators to join the new BRT and bus concessions. Such incentives include requiring the new concessionaires to buy or rent a number of existing red plates from the small operators, the recruitment and training of drivers, encouraging local operators to join as shareholders and partners into the new concessions, and allowing operators to continue operations along the new bus and BRT lines according to specifications (schedule, bus requirements…) agreed with the concessionaires and public authorities. Since it is expected that the project will contribute to increasing the overall demand for public transportation in Lebanon, new markets are anticipated to be created and new passengers attracted to the system. This will benefit local operators since not all trips and destinations will be covered by the new system and many new passengers will still need an additional public transportation mode to bring them closer to their final destination. The existing local operators are therefore expected to adjust their operations in accordance with the newly generated demand, resulting in complementary systems” (p. 49, our emphasis). And this expectation isn’t completely left up to chance, as we feared would be the case, given how the problem of integration was initially discussed in the preliminary consultation sessions. To insure that these mitigation measures are successful, the report recommends that “the integration options…undergo further negotiations with political entities and syndicates and unions,” going as far as calling for monthly monitoring of impact based on “surveys of bus operators, taxis, mini-buses, etc. at areas impacted by the BRT service” (p. 347) conducted by Ministry of Public Works and Transport (Traffic, Trucks and Vehicles Management). We wholeheartedly welcome this approach, and hope that both sides take seriously the need for cooperation. With recent shifts in discourse (see also), we are cautiously optimistic. At the same time, it’s worth pointing out how this “accommodationist” approach awkwardly negotiates an underlying tension between two different understandings of the city: the city as a project (designed, regulated, legislated), versus the city as a practice (emergent, patterned, lived). On the one hand, the impact report deploys analytical and rhetorical strategies that still prioritize state-led initiatives, as seen in the way that impact source “SE.O.1” is separated from impact source “SE.D.1”. For the latter, ELARD writes that “the preliminary assessment of the project already considered the wider Land Transport Sector Strategy that has been recently developed by the Ministry of Public Works and Transport (MoPWT)…reducing the chances for any conflict with future public transport developments” (p. 312). This subtle splitting of “secondary public transport systems” into two categories re-inscribes a hierarchical distinction between the formal and the informal. Note how this is even reflected in the different languages used: the formal has “strategy” and “developments,” while the informal “serves demand,” has “operations,” and is “random.” We bring this up only to acknowledge the limits of the whole “paratransit”/”gap-filler” approach to informal transport, from our perspective — it’s greatly appreciated, but only in the sense that it tames state aggression. Having said that, we concede that we would not really expect more than accommodation in a governmental study. Indeed, while there’s a lot more that can be said about the various mitigation measures recommended by the report with regards to BRT affordability, accessibility, etc. (see p. 350), within this single matter of concern, we would be remiss if we did not underscore how impressed we are by the inclusive spirit of this report. Taken as a whole, the BRT impact report very clearly recognizes that project success requires state willingness to work with and include existing transit actors as legitimate partners. “The social impacts from the Project are the widest in breadth and depth, and they range from beneficial to the overall public to sensitive to the current operators of the informal public transport system. The beneficial impacts from implementing the Project will ultimately be realized and noticed through reduced travel time and lower overall mobility costs. There is a serious call from all social groups consulted as part of this ESIA study to implement a solution for public transport, where the system should respond to the needs of all groups – women, elderly, persons with mobility challenges, students, professionals, etc. The quality of the services of the BRT System is also of primary interest to all stakeholders. The need to have the public transport system organized and the level of services to be improved is a call to improve the quality of life of commuters on the overall. The integration of current operators in the new setup that will operate the BRT System is a vital strategy to reduce livelihood impacts from the competition that the new system will create. All the environmental and social impacts assessed in this ESIA Study can be mitigated if negative and enhanced if positive through inclusive and universal design, through responsible implementation, and through serious operation, maintenance and follow-up from the concerned institutions. Above all, there is a great need for more consultation and coordination among institutions and municipalities to realize the social and environmental benefits that this project is anticipated to bring”. 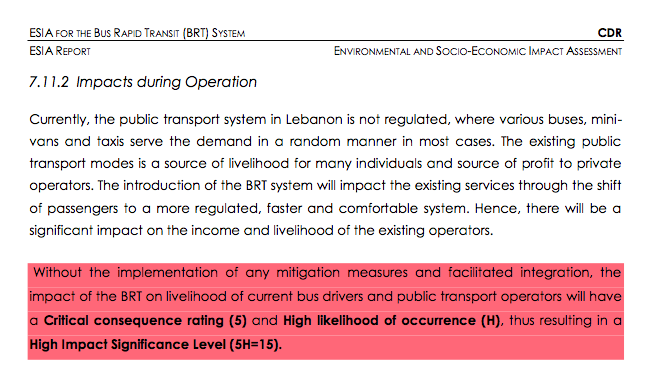 We sincerely hope that the CDR takes heed of these recommendations, as the participatory principles extolled in this report are the only real foundation for sustainable and socially-responsible investment in Lebanon’s transit system. Posted on December 7, 2017 December 7, 2017 Author BMP TeamCategories ViewsTags Advocacy, BRT, Bus, CDR, Collaboration, Design, Infrastructure, OCFTC, Public Transport, Social JusticeLeave a comment on CDR’s BRT Impact Report—One Step Closer to Inclusive Urbanism?